Lubitz' TrotskyanaNet © (or, LTN for short) provides a considerable amount of material – chiefly bio-bibliographical informations, research tools, essays and miscellanies – related to Leon Trotsky (Nov. 7, 1879 – Aug. 21, 1940) as well as to Trotskyism and Trotskyists. LTN went online on August 21, 2004; it was relaunched on April 10, 2006, August 21, 2011, and August 21, 2014. In August 2018 the site was revised and the design changed from yellow to gray. It is called up round about 100,000 times per year. LTN is an ongoing project; most of its chapters were created between 2004 and 2008, some being revised and amended several times, others remained unchanged since then. Since 2009 our Lubitz' Leon Trotsky Bibliography (LLTB) is the centrepart of LTN; it is updated semi-annually. Lubitz' Leon Trotsky Bibliography (LLTB) is now online! a feature about the printed edition (published 1993) of the Lubitz' Trotskyist Serials Bibliography plus a PDF version of this out-of-print work. several dozens of smaller bibliographies forming part of the biographical outlines about a number of more or less renowned Trotskyists (or, Ex-Trotskyist), featured within the Bio-bibliographical Sketches section of TrotskyanaNet. a feature and a photo gallery about The Trotsky Museum (Museo Casa León Trotsky, Coyoacán, México) plus an exhaustive bibliography about Trotsky's final years in Mexico and his assassination. an exhaustive bibliography, a biographical presentation [encrypted file] and other material about Ernest Mandel (1923-1995), the most renowned Trotskyist in the second half of the last century. University Works, a bibliographical repertory of dissertations, theses and similar university works on Trotsky and Trotskyism. Collectibles, featuring some of the nonprint items and memorabilia within our Trotskyana collection. Guest Contributions on various topics, authored by some 'sympathizers' of this website. The material presented on this website was written, compiled and edited by Wolfgang and Petra Lubitz, with only a few exceptions (see the section Guest contributions) as indicated in the respective sections. We thoroughly disapprove the violation of intellectual property right in general and of copyright law in particular! To crib parts of a website for own purposes or for redistribution on other websites does not exactly cover the plagiarist in glory. Rather, such a behaviour is absolutely inacceptable and lacks any integrity, let alone any scholarly requirement. All bio-bibliographical and related material provided on TrotskyanaNet is available for re-publication as long as such reprints include verbatim copy of the article/chapter/part in its entirety, respecting its integrity. Furthermore, reprints must cite the author(s) and "Lubitz' TrotskyanaNet" as the original source including a "live link" to the respective article/chapter/part. The date of access/viewing must be given, too. Abbreviations used in texts, bibliographies etc. provided on TrotskyanaNet are explained in a list of abbreviations. For an explanation of the transliteration of Cyrillic characters used on TrotskyanaNet see the transliteration table. This site was designed for Mozilla Firefox, but also runs with other browsers like Windows Internet Explorer, Edge, Opera, Safari and others; please note that certain functions may not (or, not correctly) be performed by every browser alike. The site is generated without any frames. Keep this in mind if you like to print texts. We recommend in such cases to mark the text you like to print and choose 'selection' in your printer options. Generally a print version is also provided! On this site you will find a lot of PDF-files. For best performance use Adobe Acrobat Reader or Foxit Reader. This site comes without Javacript or other active elements except for texts which are encrypted for copyright reasons. In very rare cases it happens that your antivirus program detects malicious code when trying to open encrypted files. True is that encoded texts cannot be proofed of malicious codes. Wrong is that there is an infection. Please check the options section of your antivirus program and join such files to your white list. We are concerned about individuals with disabilities. Though we are no professional webdesigners, we tried to do our best creating a barrier-reduced website. The whole site is designed and validated according to the recommendations and standards of the World Wide Web Consortium (W3C) . The main subject of our TrotskyanaNet website, Leon Trotsky [Лев Давидович Троцкий], was born as Lev (or, Leib) Bronshtein [Лев Бронштейн] at Ianovka (Russian Empire) on Nov. 7, 1879 (=Oct. 26 according to the Julian calendar style, see also the Genealogy chapter within TrotskyanaNet), and murdered in Coyoacán (Mexico). He was an eminent Marxist revolutionary theoretician and uncompromising internationalist, protagonist of the Russian revolutions in 1905 and 1917, creator and chief of the Red Army, leader of the anti-Stalinist Russian and International Left Opposition, founder of the Fourth International, distinguished author, editor, journalist, essayist, polemicist, historian, and literary critic – of course one of the most enigmatic and controversial political figures of the 20th century. He was (and still is) the subject of an immense amount of scholarly, polemical and ephemeral literature as well as of films, dramas, novels and other fiction; for all those and similar materials we use the term "Trotskyana". 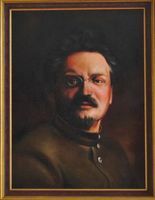 The photograph above (taken by P. Lubitz) depicts a portrait of Trotsky (oil on canvas, ca. 40x60 cm) which was painted by Eduard Panosian (Leipzig) in 2012 as a commissioned work based on photographs shot in Moscow in 1919/1920 portraying 40 years old Trotsky as People's Commissar of War; the painting forms part of our extensive private Trotskyana collection. For a nice little slide-show (duration: 3'56") depicting Trotsky's life in photographs, caricatures, paintings etc. see the video Trotsky on YouTube.